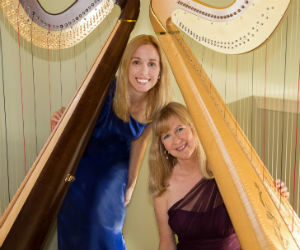 “True artistry in tandem” and “poetry in motion” are what audiences are saying to describe the playing styles of duo harpists, Mindy Cutcher and Janet Witman. Principally Harps blends the talents and experiences of two of America’s finest harpists in presentations of virtuosity, distinct style and impeccable ensemble. Their varied programs include stunning adaptations of great “hits” from opera, ballet and orchestral repertoire: “Le Cid”, “Swan Lake” to beloved favorites, “Clair de Lune”, “Blue Danube”; from original works of iconic harpist Carlos Salzedo to popular works of Joplin, Bacharach and Gershwin. Read more about Principally Harps at http://www.principallyharps.com/about-us.html. Mindy Cutcher is a graduate of The Oberlin Conservatory of Music and is Principal Harpist for the Pennsylvania Ballet Orchestra. She has performed with several orchestras including the Baltimore and Delaware Symphonies, the Philadelphia Opera Orchestra and Philadelphia’s Chamber Orchestra. Her newest album, Reverie, is a compilation of light classical pieces on the HBR label. Click here to read her complete bio. Janet Witman is a graduate of the Curtis Institute of Music and has successfully crisscrossed the realms of classical and Celtic harp music. She is principal harpist with Kennett Symphony and is founder and director of the Brandywine Harp Orchestra, the only continuous playing harp orchestra in the United States. Click here for her complete bio. Dancefusion returns to Pendle Hill this year after delighting our New Years’ Eve audience last year. Under the direction of Artistic Director and founder Gwendolyn Bye, Dancefusion is a modern dance repertory company dedicated both to the reconstruction of historic works from America’s rich record of modern dance, and to the creation of innovative new works. Dancefusion serves its mission by 1) reconstructing historic works; 2) introducing new choreography; 3) providing dance training through programs at the Gwendolyn Bye Dance Center and educational residencies for the community; 4) nurturing fusion2, training company for young dancers, and; 5) expanding public awareness through programs and performances to diverse audiences. 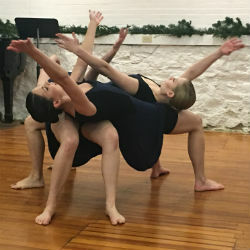 For more information, visit https://www.gbyedance.org/.